After a lengthy national search, UKRO is delighted to announce the successful recruitment of a Director for the joint USC/UKRO Kidney Research Center. Serving as Director of the USC/UKRO Kidney Research Center will be Kenneth R. Hallows, M.D., Ph.D., F.A.S.N., from the University of Pittsburgh’s School of Medicine, where he is currently an Associate Professor of Medicine and of Cell Biology, along with Assistant Dean and Co-Director of the Medical Scientist Training Program in the Renal-Electrolyte Division of the Center for Critical Care Nephrology. Joining him will be Núria M. Pastor-Soler, M.D., Ph.D., an Associate Professor of Medicine at the University of Pittsburgh whose research interests include the regulation of epithelial transport proteins in sepsis-induced acute kidney injury. The USC/UKRO Kidney Research Center plans to recruit a minimum of three additional core researchers over the next five years, along with necessary support staff. Renal scientists already on the University of Southern California’s Health Sciences Campus will work with the KRC to create a powerful critical mass for kidney research here in the Los Angeles region. 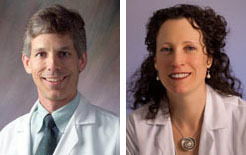 Click here to see a list of USC scientists already working in the renal area.